The Group 1 Prix Du Jockey Club, commonly known as the French Derby, takes place at Chantilly this weekend over a mile and a quarter. Despite the distance being reduced from a mile and a half in 2005, the race continues to produce top class middle-distance performers. Shamardal was the first horse to benefit from the new distance but he was the last winner to be trained outside of France. Andre Fabre trained his third French Derby winner last year with Intello following Lope De Vaga in 2010 and Peintre Celebre in 1997. The hot favourite this year is Prince Gibraltar, as short as 6-4 with Bet365. 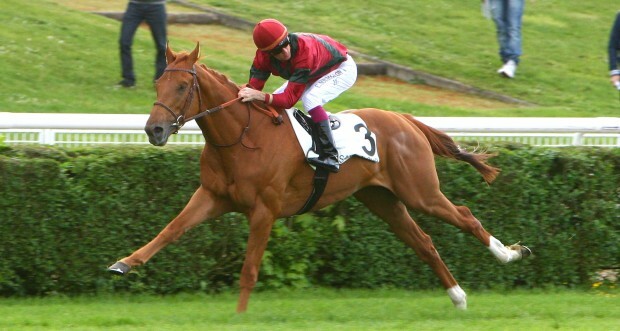 The chestnut son of Rock Of Gibraltar has won his last three starts by an aggregate of nearly ten lengths. He was particularly impressive under Christophe Soumillon when winning a Group 2 in soft ground last time out from Earnshaw. Soumillon was able to ease him down in the closing stages and still had two lengths to spare. That was his first start since November and he is expected to improve again. He already has winning form in a Group 1 having taken the Criterium de Saint-Cloud when steered clear of his rivals. He has a smart turn of foot which should enable him to get out of trouble in a large field this weekend. Trainer Jonathan Pease has decided to run Karakontie here instead of in the Investec Derby at Epsom. The son of Bernstein ended his juvenile campaign with victory in the Prix Jean-Luc Lagardere at Longchamp. He was surprisingly beaten by Ectot in April but improved to win the French 2000 Guineas last time. Connections were concerned that the ground may be too testing for the colt to stay a mile and a half at Epsom and have elected for the shorter distance. French Guineas runner-up Prestige Vendome is next in the betting after going down by a quarter of a length at Longchamp. The trip is also an unknown for the grey who twice finished behind Ectot prior to his fine run in the Guineas. Kevin Ryan sends over York Dante Stakes winner The Grey Gatsby who held the late thrust of Arod by three-quarters of a length on the Knavesmire. That was a big step up from his previous run in the Newmarket Guineas when only tenth of fourteen behind Night Of Thunder. He is accompanied by Roger Varian’s Hamilton winner Aryad, a chestnut son of French Derby winner Dalakhani. Other interesting contenders include Andre Fabre’s Galiway, beaten in heavy ground at Newbury in October and fifth in the French Guineas. His Highness The Aka Khan’s colours are set to be carried by Shamkiyr, a son of Sea The Stars. He won his maiden by eight lengths and could be the each-way value in the race.